"Wait List" above the product title to be notified when the item will be back in stock. A special magazine from the Doctor Who Appreciation Society in Canada. 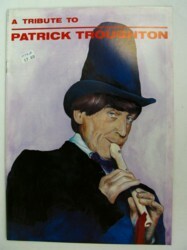 40 pages about the 2nd Doctor and his career with many B&W photos, a filmography, a television chronology and more. *Please note that the magazine is not MINT and has minor scuffing from shipping as well as a price sticker on the cover. � 2006 Alien Entertainment Company All rights reserved.